Arguably more than any other region, the area known as Eastern Europe has been defined by its location on the map. Yet its inhabitants, from statesmen to literati and from cultural-economic elites to the poorest emigrants, have consistently forged or fathomed links to distant lands, populations, and intellectual traditions. 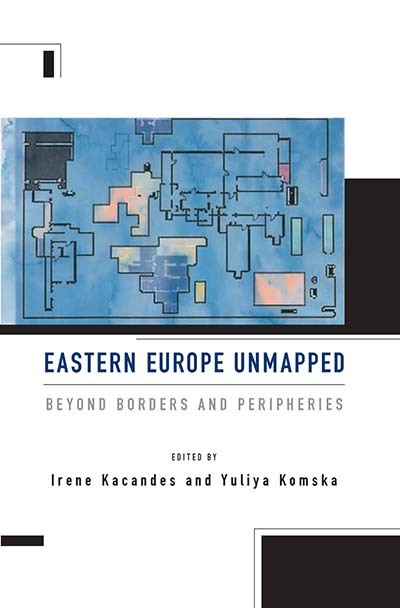 Through a series of inventive cultural and historical explorations, Eastern Europe Unmapped dispenses with scholars’ long-time preoccupation with national and regional borders, instead raising provocative questions about the area’s non-contiguous—and frequently global or extraterritorial—entanglements. Irene Kacandes holds The Dartmouth Professorship in German Studies and Comparative Literature. Her publications include an experimental paramemoir on generational trauma, Daddy’s War (2009), and a reflection on mortality co-authored with Steve Gordon, Let’s Talk about Death: Asking the Questions That Profoundly Change the Way We Live and Die (2015). She edits the “Interdisciplinary German Cultural Studies” series for de Gruyter Verlag and was President of the German Studies Association from 2015 to 2016. Yuliya Komska is Associate Professor of German Studies at Dartmouth College. She is the author of The Icon Curtain: The Cold War’s Quiet Border (University of Chicago Press, 2015) and the guest editor of a special radio-themed issue of German Politics and Society (2014). In recent years, she has written about the transatlantic impact and memory of Radio Free Europe and is now completing a book about its visual history entitled Perfect Propaganda: Cold War Radio in the Golden Age of Television, 1950–1967.